This week’s WordPress’s Weekly Photo Challenge topic is “extra extra.” Gayle calls her submission: “Facetiming with Eva Louise.” Instead of regretting the fact that her grandchildren are far away in Norway (we live in British Columbia, Canada), she regularly communicates on her I-pad with her grandchildren via her daughter’s I-phone. 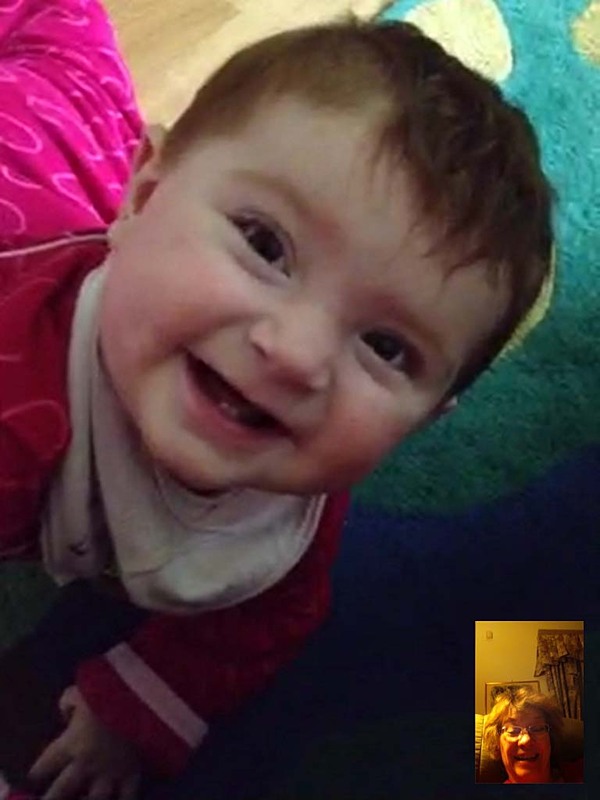 What a wonderful invention Facetime is for those of us who have family members that live far away. It is wonderful to be able to communicate with them electronically when you aren’t physically present with one another and also great to be able to watch a young child grow and develop. Our “extra” part of the smiling photo of 10-month-old granddaughter Eva Louise is the little insert at the lower right of grinning Grandma Gayle, slightly desheveled since she was awakened by daughter Gwynne’s call at 1 a.m. Pacific Daylight Time. It was 10 a.m. Central European Time so, in contrast, Eva Louise was freshly washed and dressed for the occasion. Thanks to daughter Gwynne’s instructions, Grandma has learned how to snap a photo as she is talking and viewing on Facetime. A great invention! This entry was posted in family heritage, Norwegian theme, Photography challenge and tagged a smile is worth a thousand words, children, family, grandchildren, grandparental role, Norway, positive influences in early life, Smiles, transatlantic communication. Bookmark the permalink.